sponsored 8 mile walk around Tunbridge Wells. One of the wettest gigs of the year but so much fun! Playing at the Neville Cricket Ground in Tunbridge Wells as the crowds turned up for the Moonlight Catwalk for Hospice in the Weald. A large band of about 30 played for about 45 minutes once the cricket stopped ! The eight-mile Moonlight Catwalk took place on Friday June 15, beginning at Claremont Primary School in Banner Farm Road, Tunbridge Wells at 10pm. In aid of Hospice in the Weald, walkers were asked to dress to impress and come along for a night on the town. Surprises and treats were available along the way to keep everyone going, plus there was a free celebratory drinks and chocolate at the end. 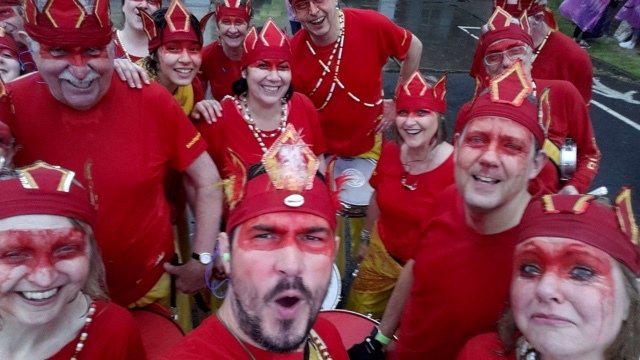 Bloco Fogo were there to keep spirits high as the walkers gathered at the start and begin their warm up routines.